Yesterday I returned to a place I had been to only once before. The town of Bayfield, WI is along Wisconsin’s Lake Superior shoreline, and despite being a very small town (population less than 500), it is popular in the summer, as it is linked to the Apostle Islands, which is an island chain in Lake Superior with some unique scenery. 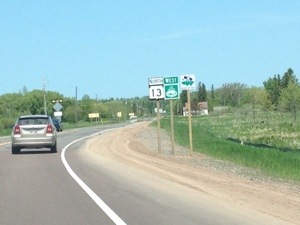 Due to the geography of Wisconsin, this is the northernmost part of the state. It is the only part of the Lake Superior shoreline in Wisconsin, as farther east, the shoreline hits the Upper Peninsula of Michigan. This part of the state is actually over 300 miles from both Milwaukee and Madison, making it quite different than the part of the state I am most familiar with. 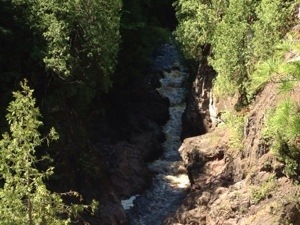 In fact, someone once told me that sometime in the 1970s there was talk of this part of Wisconsin joining with the U.P. of Michigan to form a new state, breaking away from their respective states due to serious cultural differences. The first time I came here, in 2007, I was kind of obsessed with waterfalls. 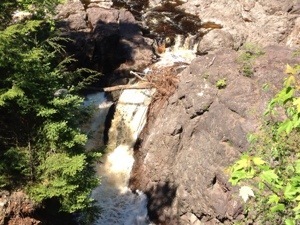 So, I found a place called Copper Falls State Park, which has some pretty nice falls. 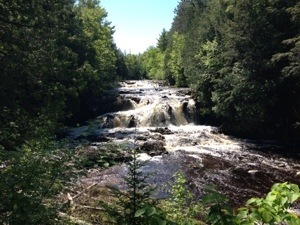 This particular trip warranted a return trip to Copper Falls, as some of the others on this trip live in Chicago, where there is little opportunity to find good waterfalls. 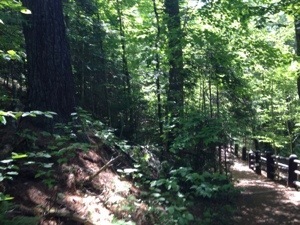 The trail system at this state park is actually part of a larger trail system called the North Country National Scenic Trail. This trail system is only partially complete, but they eventually hope to connect central North Dakota all the way to upstate New York via a trail that follows some of the northernmost parts of the country. I am guessing they are hoping for it to be like the Appalachian Trail, but it seems like they are still a long way from completing this trail, and even when it’s completed it will be nowhere near as scenic as the Appalachian Trail, or the Great Divide or Colorado Trail for that matter. The hiking here was pretty easy, especially when compared with some of the hikes I have been doing more recently, with the move to Colorado and the trip to South Dakota. However, they did have some decent waterfalls in several different places. 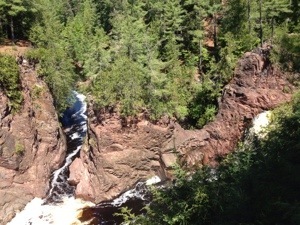 They are called the “Copper Falls”, due to their coloring, which actually comes from the type of red clay present in the region. As far as I know, the region has nothing to do with the mineral copper, and nor does the name of this particular waterfall. Having lived in Colorado for some time now, a few things about this hike seemed quite different than what I am now used to. First of all, the hike felt to me like a luxury hike compared with what I have been doing more recently. There were some areas where staircases had been built, and there was even a sheltered bench built for resting. This is not something I have come to expect on a hiking trail. I had become accustomed to simply using a good rock or log to rest on if I were to get tired. It was also way more wooded here than what I had become accustomed to. 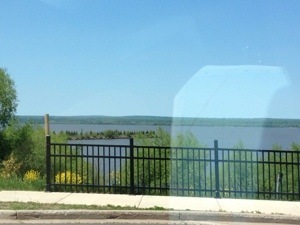 I guess they call it the “north woods” for a reason. It was so wooded here that I did not suffer any consequence for forgetting to wear sunscreen. 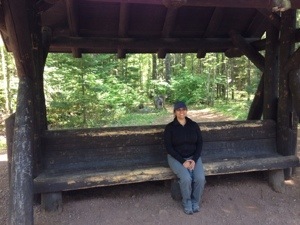 At the end of the hike, I was actually way more anxious to put on bug spray. Parts of this hike had an excessively large concentration of mosquitoes. I think I killed like 50 of them and still got a bunch of bites. I cannot even seem to recall the last time I was in such a mosquito infested area. 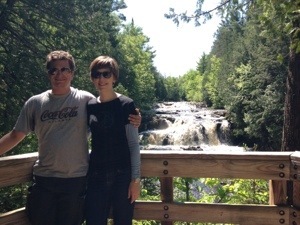 After hiking Copper Falls, we drove up to Bayfield, the town most closely associated with the Apostle Islands. This is because the ferries that run to the islands all run out of this town. On the way up there, we hit the Lake Superior shore, and subsequently the Lake Superior circle tour, which is a series of roads that a motorist could follow around the lake. When I lived in Chicago, I recall being along and seeing signs for the Lake Michigan circle tour from time to time. In fact, that tour follows Lake Shore Drive in the city. The signs are neat, but taking the two or so days to drive around the lake seems like a strange idea to me. 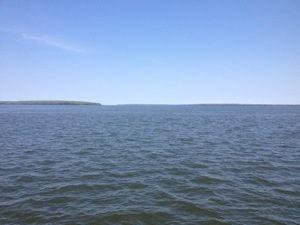 We took a ferry to Madeline Island, which is the largest island in the chain. In fact, it is the only island with roads. The others are largely uninhabited, but people still take boats, kayaks, etc., and camp and hike there. We did not end up spending too much time on Madeline Island. There wasn’t too much to do there, at least not for us. They do have a golf course, some beaches and trails, but it seemed to me that most things available on the island are also available in Bayfield, and in other areas on the mainland. Maybe it is still not quite peak tourist season yet. 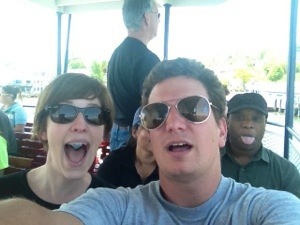 I did enjoy the ferry ride. It actually brought back some distant memories for me. 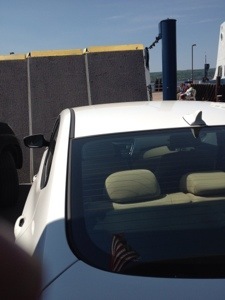 When I was a kid, growing up on Long Island, my family would periodically take trips that would involve bringing our car on the Orient Point ferry to Connecticut. This ferry ride was not nearly as long, and on fresh water instead of salt water, but driving onto the ferry and walking up the stairs did bring back those memories a couple of decades later. It is strange how, after all those years, the feelings can still be the same. The people with me probably thought my behavior at this point in time was a bit odd, as I was doing and saying certain things out of some kind of long dormant reflex that likely made little sense in the context of where we were. I even stated to crave seafood. It was somewhat of an odd feeling, but a good one. 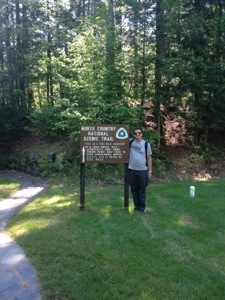 This entry was posted in hiking, Unique Natural Features, Wisconsin and tagged Ferries, Hiking, Waterfalls, Wisconsin on June 14, 2013 by Stephen Jaye.